This section covers JSA-related series which are (intentionally or not) "out of continuity." Listed alphabetically by title. Since the Infinite Crisis, some Elseworlds tales have been given their own Earth in the new multiverse. If so, this is noted in the header. 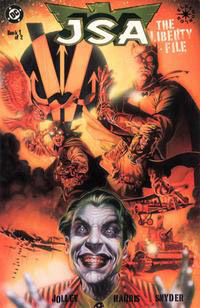 The Golden Age trade paperback (1995); art by Paul Smith. After successfully transferring his brain into the body of Mister America in 1945, the Ultra-Humanite rises in political power and develops a way to create a "superman." He transplants the brain of Adolf Hitler into Dan Dunbar, creating a new American hero, Dynaman. "Tex Thompson" is betrayed by his wife, Miss America, who finds his journals and gives them to her old All-Star friends. The story references January 1950, when Alan Scott is summoned to the HUAC hearings. Although this was an "Elseworlds" series, it's themes were powerful enough to make it into mainstream comics as well. The most prominent of these is James Robinson's continued development of Starman, which began here in The Golden Age. Other things introduced include the potential evil in Captain Triumph (1st post-Crisis appearance) and the fall of the Tigress. It features first-time DC appearances by some Quality heroes—Joe Hercules, "Stormy" Foster, Wildfire, Madame Fatal, Doll Girl; plus Red Torpedo, Neon, the Spider, Firebrand and the Red Bee; and and other obscure "All-Stars" such as Captain X. For more deatils on James Robinson's intent for this series, read my interview in The Quality Companion! From JSA: The Liberty File #2 (2000); art by Tony Harris. When narrated, the Liberty File stories are told by the Bat. You can read both series collected in one trade paperback. STORY: 1942: In the days of World War II, an albino psychopath, Jack the Grin (the Joker), intercepts knowledge of a Nazi secret weapon. When Jack is apprehended, he escapes, bringing the plane and its American Agents down in Egypt. The Bat and Clock next meet another agent, Terry Sloane (Mister Terrific) in Bern, Switzerland. While recovering from injuries, the Owl is attacked and killed by a Nazi agent called the Scarecrow. In the ensuing firefight, Sloane's fiancee, Eva, is also killed. The next series, The Unholy Three reveals that the Americans do not perfect the nuclear bomb until 1948. Instead of bombs, it is the super-men that win the war for the Allies. ROLL CALL: The Clock, The Owl (deceased), The Bat, Mister Terrific, Canary, Ted Grant (deceased), Johann (the Martian), Robin, Super-Man. STORY: In 1944, following their infamous mission, Terry Sloane's hatred for the Bat over his fiancee's death was so great, he nearly killed Wayne in revenge. He later went to work for Tyler Chemicals. 1948: In Berlin, a rogue KGB agent called the Parasite tortured and killed Sandy Hawkins and Johnny Thunder for information. J'onn J'onnz now worked on the moon helping NASA construct a base. In Gotham, the Bat pursued Harvey Dent, who had been transformed into a half-monster by Arcane's magic. When Bruce returned home, he found Gen. Maitland waiting to ask him to return to service. By this time, they have prepared Clark Kent, Super-Man, for service, too. Bruce recalled his old ally, Rick Tyler, who had been researching a way to duplicate Kent's powers. Zod revealed that he was sentenced at age 11 to the Phantom Zone on Krypton. Later on Earth, American scientists in the "Wormhole Project" freed him. The boy lived with the Kents, under government supervision. When Zod rejoined his "allies," they met a deep cover agent, the Sandman. He told them the Soviets had a trigger that could detonate every nuclear weapon across the globe. They're to meet the Lantern later at a social event for more information. Zod intercepted the intel then killed the Lantern. He knew that the "trigger project" produced a kind of radiation that could cripple him. Dodds warned the others, and the Bat called all available agents to stop Zod from finding the trigger. From across Eurasia, the Atom, Mercury, the Hawk, Tornado and the Huntress responded. They converged on the city of Chernobyl, where another deep cover agent, the Star, fought Super-Man. Zod killed the Atom and the Hawk before Terry Sloane arrived with Tyler's own experimental super-serum. The Bat injected the serum and was transformed into a powerhouse. He and the Star managed to unleash the project's radiation on Zod, but activated the reactor/trigger as well. Using the Star's cosmic rod, he, the Bat, and the Clock combined will power to contain Zod and the reactor, and sent them into space, where he exploded. ROLL CALL: The Bat, the Clock, Super-Man (turned), Johnny Thunder (deceased), Sandy Hawkins (deceased), Shiera Saunders (deceased), Pemberton (deceased), the Sandman, the Lantern (deceased), the Atom (deceased), Mercury, the Hawk (deceased), Tornado, the Huntress, the Star, Mr. Terrific. From Countdown: Arena #1 (2008); art by Scott McDaniel. This particular interpretation of the 52 universes has been revised in the wake of DC's "New 52" relaunch. The fate of this Batman is uncertain. An early promotional cover for the series, before it was absorbed by DC. Johannes (right) and Michael Keene and Mr. Teagle. From JSA Liberty Files: The Whistling Skull #1 and #6 (2013); art by Tony Harris. Left: The Whistling Skull and Knuckles. Right: Hellman's Karneval. From JSA Liberty Files: The Whistling Skull #3 and #4 (2013); art by Tony Harris. In this "universe," the Justice Society is a loose term used to describe a network of 52 groups of adventurers (whose missions sometimes intersect). Skull introduces a number of British heroes, both super-powered and non-, who work for a network called the Skeleton, an agency Teagle and Sons, run by Mr. Teagle and Dr. Archibald Moon. (#2) The Whistling Skull is a British operative who possesses the memories of his predecessors. His horrible visage is not supernatural, but a mask. (DC's original Dr. Moon first appeared in Batman #240, 1972). Another group of the 52 is the Boy Commandos, who appear in issue #4; Brooklyn and Andre are named. The Boy Commandos were created by Simon and Kirby, all the way back in Boy Commandos #1, 1942. 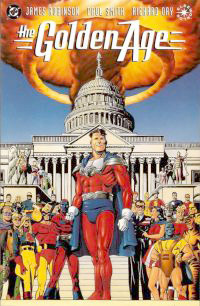 The trade paperback reveals, in a memo by John Thunder (U.S. federal liaison to the 52), that Capt. Hop Harrigan and his men were another cell. The trade paperback of this series included new material from the creators which revealed additional secrets and clarified some things. Singleton's son, Nigel, first met young William Massey in London, in 1925. Being a rather "slow" child, Nigel had few friends. The boys' friendship became a brother-like bond, one noticed by Nigel's father. It moved John Singleton to name William Massey as his successor, the seventh Whistling Skull. What's more, Nigel Singleton possessed innate super-strength. When John went missing, Mr. Teagle recruited William for the Skull position. They told him that Singleton had died, a fact which Massey chose to withhold from Nigel. The Whistling Skull has no super-powers, but thanks to the mental abilities of Dr. Moon, he has all the memories of his predecessors. Nigel's fists are as tough as steel due to the ointment given to him by his father. The boys found Hellman's laboratory but the villain escaped. In their inevitable clash, William took a knife to the chest and one of Hellmanm's monsters turns out to be Johannes's brother, Viktor. (#5) To help him win against Hellman, the Skull recieved help from another (unnamed) agent. From this agent's lab inside Big Ben, William was given a teleportation device in the form of a pocket watch. It could only use once, and the watch allowed the Skull to gain the upper hand against Hellman, who was finally captured. En route to his incarceration, Hellman's train was stopped by the Gestapo and he went with them. The series also featured the first appearance of an unnamed, multinational group of young soldiers (Brooklyn, Jan, and others). From Superman/Batman Genereations II #1 (2001); art by John Byrne. In this tale, Superman and Batman, along with most other original Golden Age DC heroes, debut in the 1930s-40s and form the Justice Society. Their JSA lasts until the "Silver Age," adding members who normally would have founded the Justice League. The heroes who normally founded the Teen Titans become the Justice League instead. The first Generations series did not deal with the super-groups, only the title characters.